Nate Boulten accepts the endorsement of 10 union groups. 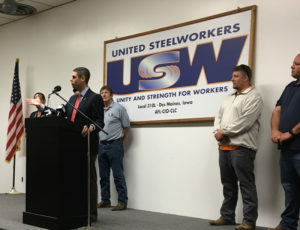 Ten labor organizations, including statewide unions representing steelworkers and brick layers, have endorsed Democratic state Senator Nate Boulton’s bid for governor. The groups, which represent about 20,000 workers, held a news conference at a union hall in Des Moines this morning. “I am so proud to be on this stage right now as we start our campaign for governor with so many great representatives of so many powerful and hardworking unions that do so much to advance the cause of working Iowans every day,” Boulton said. Boulton, a 36-year-old attorney from Des Moines, was elected to the Iowa Senate last November. He quickly became a leading voice for Democrats as they railed against Republican plans that have rolled back bargaining rights for public sector unions and changed the rules for compensating injured workers. “Certainly after the legislative session was over, there was absolutely no doubt who our champion is and who the guy we’re going to support is,” Earl Agan, president of the Central Iowa Building and Construction Trades Council, said during the event. Boulton grew up in a union household. His dad’s been a member of the Steelworkers for more than 40 years. Boulton told reporters union voters will play a very important role in the 2018 Democratic gubernatorial primary. In addition to the Steelworkers, Boulton has the backing of labor organizations that represent Des Moines police officers and fire fighters as well as the Plumbers and Steam Fitters Local based in Des Moines. Boulton officially became a candidate for governor last week. He may face a crowded field of competitors for the Democratic Party’s next nomination for governor. A handful of Democrats have formally launched a campaign or opened exploratory bids, with a couple of others rumored to be mulling a run.